Bay of Galway, Los Angeles is not. However, you don’t need to be Irish to get into the St. Patrick’s Day spirit in the city. 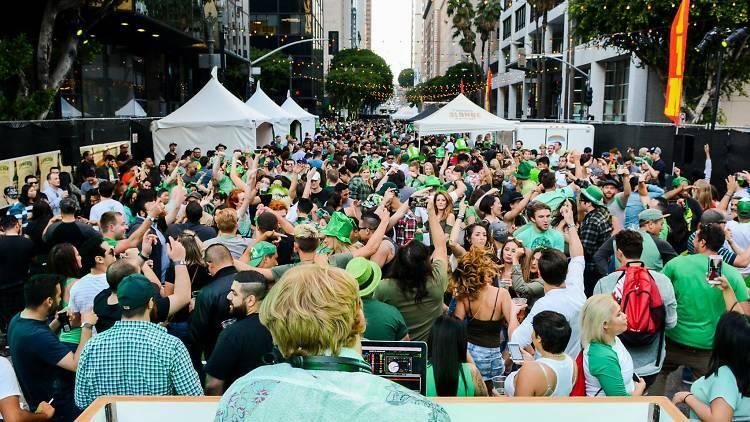 If you are in Los Angeles and looking to join this excuse to celebrate, there are a number of fun ways to do so, many of them involving simply tracking down the nearest Irish pub and getting lost in the crowd. If you are interested in spending St. Patrick’s Day doing more than just eating corned beef and drinking, the Celtic Irish Dance Academy offers lessons on St. Patrick’s Day and all year-round for the whole family. You might know it from River Dance, but this dance is actually an ancient Celtic art and harder than it looks. You can find a pub crawl in any Los Angeles neighborhood, but why not head to Hollywood if you are going to do it. This crawl hits up seven of Hollywood’s coolest bars and comes with the same crowds you would expect. If you want a more daring way to spend your St. Patrick’s Day, the Getting Lucky show at Harvelle’s in Long Beach is a city St. Patrick’s Day favorite. It titillates, tantalized, and teases to no end. The Casey St. Patrick’s Day Street Festival shuts down four downtown blocks to offer you everything Irish on St. Patrick’s Day. Lots of beer, green or not, whiskey, and food to compliment the DJs and dance floors. That take over the area until 2 in the morning. Every St. Patrick’s Day the Vista Theatre, a 95 year old vintage cinema, shows the cult classic and quintessential St. Patrick’s Day film Leprechaun. It is an excessively bad film, but you will be in great company.